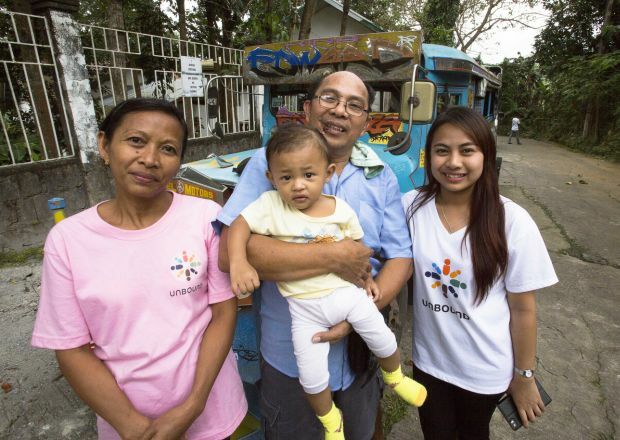 ANTIPOLO, Philippines (CNS) — Domingueto and Olimpia Ranola are proud of their daughter, Maricel, the only one of their nine children to go to college and one of the few young people from San Isidoro Labrador Parish chosen to attend Pope Francis’ Jan. 18 meeting with youths in Manila. In an interview in their neat little rented home in the San Luis neighborhood of Antipolo, on the slopes of the Sierra Madre east of Manila, they both beamed when speaking about their children and when playing with their 1-year-old granddaughter. But tears came to their eyes Jan. 14 as they discussed the circumstances that made them so grateful to Unbound, a U.S.-based, Catholic-inspired organization that recruits sponsors in the United States to help young people and the elderly in developing countries, including the Philippines. Her husband, a man of few words, fidgeted during the interview, nervously wiping his face with a towel in the hot, damp weather, and using a stick to prod the dog that wandered in uninvited. The family is doing better now. Three days a week, Domingueto Ranola drives a jeepney from 4 a.m. to 10 p.m., earning the equivalent of a little more than $11 a day. Another two days a week, he works at the jeepney depot collecting fares; that brings in another $8 a day. Although Maricel Ranola is just a few months away from graduation after studying secondary education at the Antipolo campus of LaSalle College, her father said he is still surprised she was able to get into the university. “It’s a blessing,” Olimpia Ranola added, and it’s just one of many that came from Unbound sponsoring her daughter, paying her school fees and helping with supplies, the school uniforms and sometimes food. 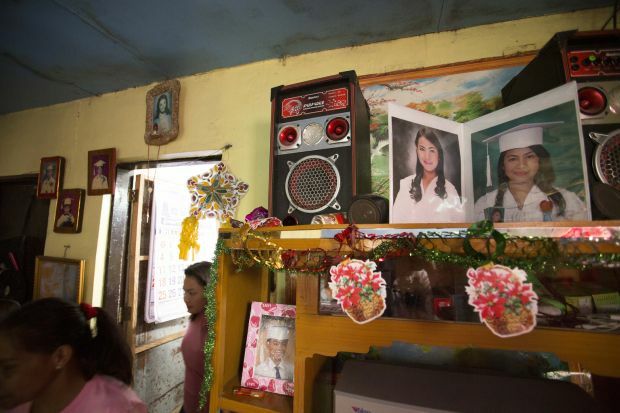 Maricel Ranola, 21, will graduate in March and hopes to begin teaching high school English by June. Then she’ll start setting aside money so that she can buy her family a home; they have received an eviction notice from the place where they live now. She is petite and knows she does not look 21. She said she is grateful to Unbound for its support of her studies and for the weekly group meetings that include tutorials, sports, music and dance. She now helps the younger children in Unbound with their English homework. She also said she was excited about seeing the pope. “I want to hear him giving me advice as a youth; basically to know what is his message for me about mercy and compassion,” the theme of his visit to the Philippines. The parents of sponsored children must get involved in the Unbound community groups, one for mothers and one for fathers. They meet each week to pray, to share their goals and the steps they are taking to achieve them and to band together in community-service projects and lobbying to improve their neighborhood.